If you were to close your eyes and picture a cowboy in the American Southwest, chances are good that there's a cactus in that picture, pardner. In fact, Mexico and the southwestern US are hot spots for cactus biodiversity. Cactuses typically grow in deserts and semi-desert regions, and many species can go months without rain. Some cactuses, though, are rain forest species. These cactuses are mostly epiphytes (plants that grow on other plants). The Cactus Family is endemic to the New World—North, Central, and South America—with one genus that's an exception: species of Rhipsalis can be found high in the trees in rain forests of Africa, Madagascar, Sri Lanka, and the Mascarene and Seychelle Islands. 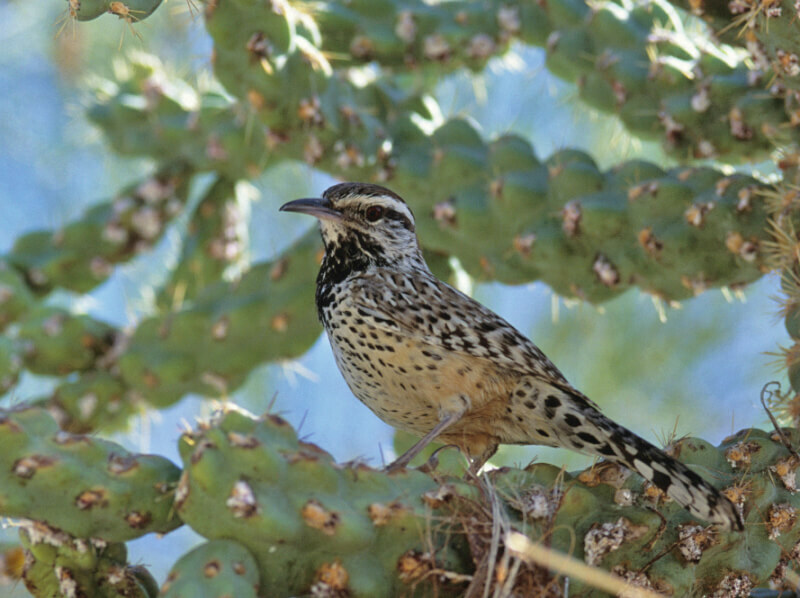 A cactus' sharp spines protect the plant from most herbivores, although rodents, woodpeckers, and collared peccaries may snack on cactus stems. Spines may also help to shade the stem, collect moisture from dew or fog, and break up evaporative winds. Depending on the species, a cactus stem may be cylindrical, spherical, or flattened. It's often ribbed and may be jointed. A strong, thick cuticle helps prevent water loss, but that's only part of the story of how these amazing plants survive in extreme heat and arid conditions. In fact, a cactus just might have the hardest-working stem in the plant kingdom! All plants take in the carbon dioxide (CO2) they need for photosynthesis through tiny openings called stomata (singular is stoma). At the same time, they lose water vapor through these same stomata. A cactus' stomata are sunken slightly, which shades them and protects them from wind. And, a cactus' stomata open only at night to take in CO2. Cooler nighttime temperatures mean that these plants lose far less water through open stomata. Taking in CO2 at night isn't an option for most plants. Only certain types, including cactuses, convert nighttime-acquired CO2 into molecules they can store until daylight comes. When the sun comes up, the stomata close; the plant converts the storage molecules back into CO2; and photosynthesis fires up. Looking at the thick, succulent stem of a spiny cactus, you might think that these plants don't have leaves. Actually, a cactus' spines are its leaves, adapted to suit a cactus' lifestyle. The spines grow from tiny, regularly spaced bumps on the stem, called areoles, which are modified buds. 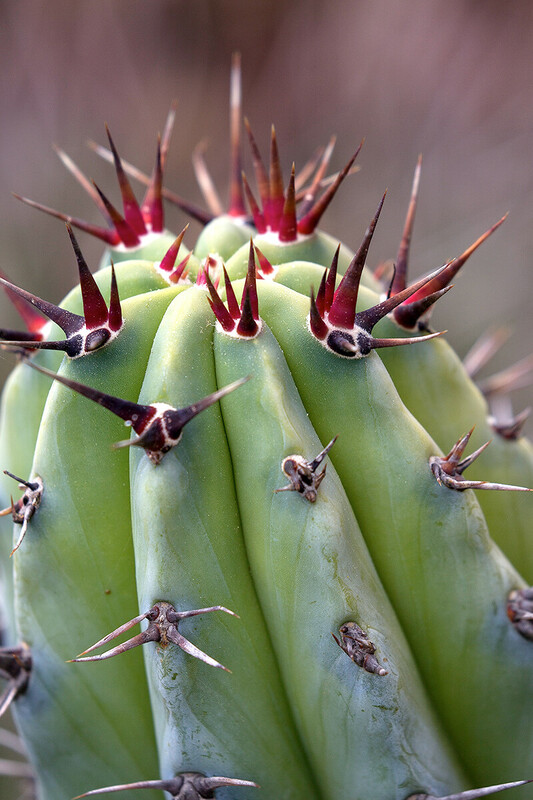 Although other plants may produce spines, thorns, or prickles, only cactuses have areoles. In many species of cactus, minute bristles called glochids (GLOH-kidz) also grow from the areole. Glochids may look soft and fuzzy, but they are barbed and wickedly sharp! While very tall cactus species grow some deep roots to anchor them in place, most cactus roots spread out and grow close to the surface, where they can quickly soak up even meager amounts of rain. When rain dampens the soil, small "rain roots" quickly sprout from perennial roots. When the soil dries up, so do the teeny rain roots. 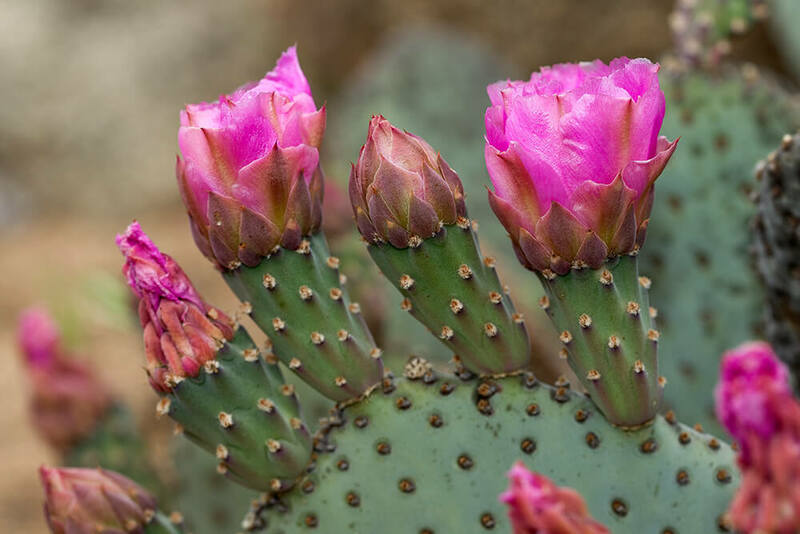 A cactus blooms during or at the end of the rainy season—often large, showy flowers that last just a few days. Various species of bees, beetles, birds, bats, and moths are important cactus pollinators. Pollinated flowers develop into pulpy fruits with lots of small seeds. Many animals find these fruits tasty, and in some cases, help disperse the seeds in their dung. As a group, cactuses take a variety of forms. Some species are just inches tall, while others stretch 60 feet (18.3 meters) into the sky. Some are single-stemmed, while others are branching or vining. Rain forest species are often epiphytes that grow on other plants. One cactus genus, Pereskia, includes about 20 species of shrubs and trees that grow leaves and don't even look like cactus! They represent the most primitive branch of the cactus family. At least one family trait is apparent, though: a close look reveals that Pereskia plants have sharp spines. Some cactus is food for people. The flattened pads, known as nopales, of some species of Opuntia cactus are de-spined and used in salads, soups, tacos, and entrees. Dragonfruit, also called pitaya and pitahaya, comes from species of Hylocereus and Stenocereus cactus. 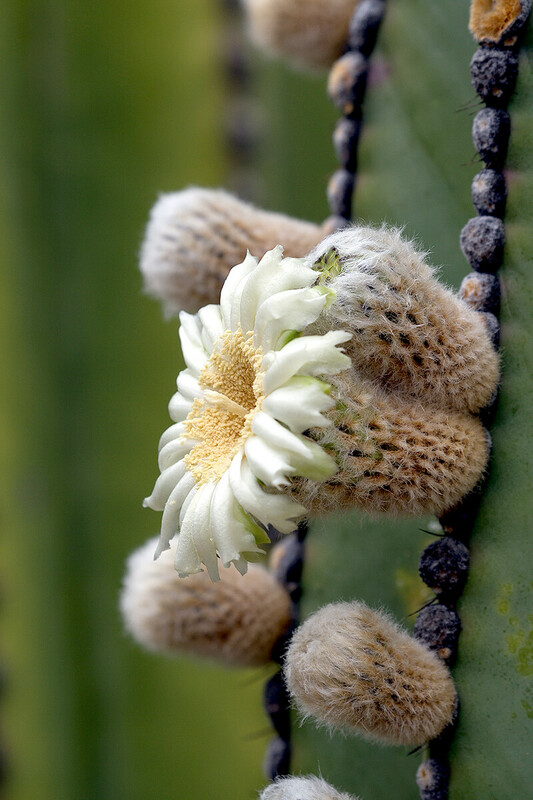 Certain other cactus fruits are eaten raw or used to make candy, preserves, and syrups. Some species of cactus are cultivated commercially for these foods. Cactuses even have a connection to textiles and cosmetics. Certain Opuntia species are host plants to Dactylopius coccus, a white, fuzzy, scale insect. Dried and crushed, the insects are the source of cochineal dye, which is also called carmine red. The natural dye is used in textiles, cosmetics, and foods, as well as in biological stains for microscopy. 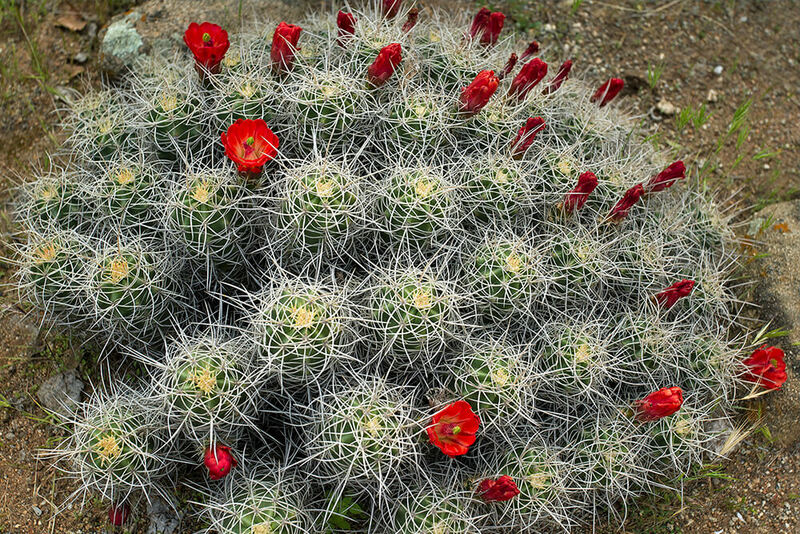 Cactuses make up one of the most threatened taxonomic groups on the IUCN Red List. Of the 1,348 species for which data were sufficient to assess, 415 species are Vulnerable, Endangered, or Critically Endangered. Nearly 80 species of cactuses are listed on CITES Appendix I, and all other species are listed on CITES Appendix II. According to the U.S. Fish and Wildlife Service (2016), 23 species of cactus are Endangered and another 12 species are Threatened. 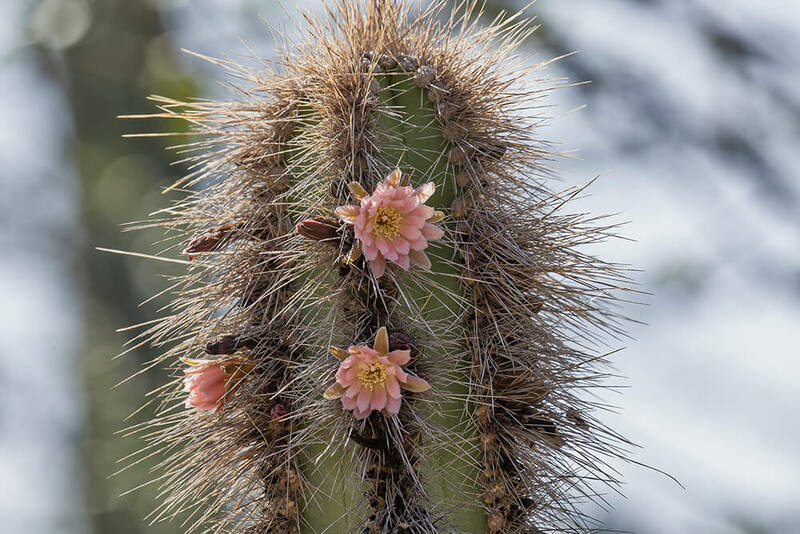 In addition, many states that are home to cactus species have drawn up state-specific lists of protected cactus species. While habitat loss due to farming and ranching is a major threat, an even bigger threat for a great number of species is illegal taking or overcollection for the horticulture trade or private collections. This has become so big a problem that staff in Saguaro National Park and Lake Mead National Recreation Area began tagging cactus plants the way people microchip their pets. A scanner can pick up a signal from a tagged cactus, deterring would-be thieves from stealing cactuses to sell. The Baja Garden at the Safari Park is a good place to view an amazing variety of cactuses. The Nativescapes Garden, an accredited garden collection at the Safari Park, is home to cardón Pachycereus pringlei and saguaro cactus Carnegiea gigantea. At the Zoo, the night-blooming cereus Hylocereus undatus sometimes flowers and produces pitahaya fruits in the Tropical Fruit Grove. Opuntia basilaris, the beavertail cactus beavertail pricklypear, is found in southwest United States. It occurs mostly in the Mojave Desert, Anza-Borrego Desert State Park, and Colorado Deserts, and also in the Colorado Plateau and northwest Mexico. Native to central Baja California Norte to southern Baja California Sur. Cactuses grow slowly and live a long time. They can be grown from seed, but new plants also readily grow from cuttings. Some horticultural specimens are cactus plants that are grafted onto the stems of different, easy-to-grow species. The cardón Pachycereus pringlei is the largest cactus species. Some plants reach heights of 60 feet (18.3 meters). Among the smallest cactus species, a fully mature Blossfeldia liliputana reaches just 1 inch (2.5 centimeters) in diameter. Barrel cactuses can come in handy for directions: they are known as "compass plants" because as they grow, they tilt slightly toward the south. Some cactuses, such as Cereus spp., bloom at night. Moths and bats pollinate night-blooming cactuses. Some cactus species can survive two years of drought. The galloping cactus Machaerocereus gummosus has the unique habit of growing downward, rooting in the ground, then springing up and out with new growth, making it look like it's jumping or galloping across the desert. Not all succulents are desert species. Some cactus species live in tropical rain forests! These species grow high in the forest, winding their roots around the branches of tall trees and using very little moisture.